GET OUT OF THE OFFICE, GET OUT OF YOUR COMFORT ZONE. Communication, collaboration, and problem-solving skills are at the core of every high-functioning team. Outward Bound’s curriculum has produced results for teams like yours for decades. No matter what challenge you face, or area you need to improve, we’ve seen it. 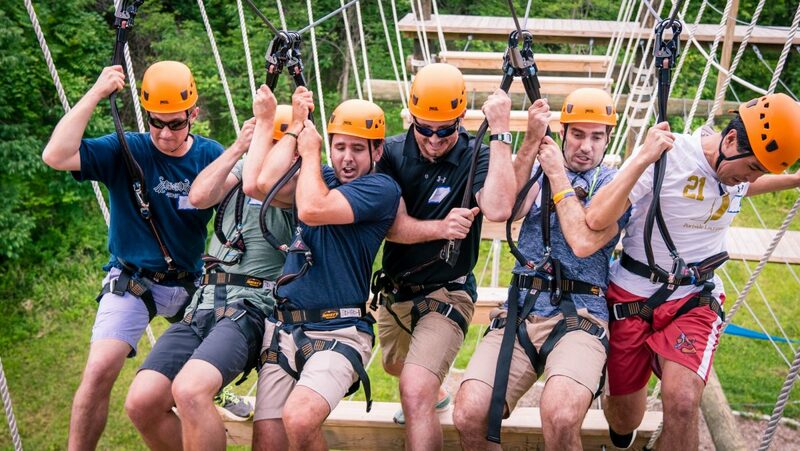 Each program combines our expert facilitators and the city's only high-ropes Challenge Course. It only takes one day to ignite change. If what you do today affects how your business runs tomorrow, why not do something to create positive change that ripples throughout your entire team? Lasting, actionable lessons will improve the way you do business, and ultimately your bottom line. Plan for tomorrow by taking action today. Our decades of experience have proved that your company's ability to overcome roadblocks, become more strategically effective, and improve team dynamics can be unlocked by focusing on one of three specific outcomes—Communication, Collaboration, or Problem-Solving. While some teams choose to come back and work on all three over time, any one of these can help you reach the next level and keep you moving toward your goals. High-intensity initiatives allow groups to assess and refine their efficiency and workflow. Reflective activities revolve around team assets and barriers that keep the group from getting to the next level. For remote teams working together, and highly interdependent office cultures. Highlights communication styles and strategies during fast-paced, high-stress, or high-stakes initiatives. Reflective activities revolve around team communication habits and produce steps to maximize communication. For newly forming work groups, inter-departmental work, and disrupting siloed work cultures. Unique initiatives draw out group process norms and assets. Teams identify strengths and barriers to more collaborative workflow, and reflect on shared approaches to the workflow. Communication, collaboration, and problem-solving skills are at the core of every high-functioning team. No matter your industry, customer, or focus, these components of leadership should be regularly cultivated, and developed with intention. Go beyond typical boardroom professional development to a place outside your comfort zone. In addition to our curriculum crafted to push participants' growth in key areas, we use other well known and effective learning models for our programs. We have a full inventory of professional tools at our disposal, and use the ones that align with your goals as a team. Check out one called 'Dimensions of Success' on the left. Our professional facilitators have worked with a myriad of clients in different industries, such as T. Rowe Price, JP Morgan, Under Armour, NASA, USNA, and the Yale School of Management. They passionately believe in guiding individuals and groups towards reflective action. Degrees such as Organizational Development, Social Work, and Business Administration give our facilitators a diverse background of knowledge to inform your work as a group. OBP facilitators obtain in-depth training in facilitation techniques and group process models, and have on average of 10+ years of experience guiding professional clients towards growth. Our facilitators come with years of experience in challenge course operations and safety management, and hold certifications such as Wilderness First Responder, Association for Challenge Course Technology Level 2 Certifications, and Emergency Medicine. Many have worked as challenge course trainers in Maryland and around the country. Read more about our Professional Facilitators here. Leakin Park is the second largest urban park in the United States, so our campus has ample space for your program. We have on-site restrooms, shaded / covered picnic areas, and an indoor ballroom space inside the historic Orianda Mansion. Our administrative building also has a conference room for 10- to 15-person teams. Since 1941, over 650,000 students in the U.S. have participated in Outward Bound programs in cities, mountains, deserts, rivers, oceans – and on Challenge Courses like ours. Throughout a wide variety of activities over the years, Outward Bound has worked diligently to achieve and maintain an excellent safety record. Today, Outward Bound is seen as an industry leader in risk management. Risk and uncertainty are central to adventure and personal growth. By embracing this philosophy, Outward Bound is committed to systematically identifying, assessing and mitigating hazards, while at the same time providing real challenges to our students. All of our programs utilize a "Choose Your Challenge" philosophy that enables participants to define their own level of challenge in a supportive setting. Participants are never forced to participate in an activity that they feel uncomfortable with. Our challenge course program, including challenge course elements, participant gear, and facilitation staff, fulfill the Association for Challenge Course Technology (ACCT) standards for construction, inspection, use, and training. As part of an ongoing effort to monitor and improve safety, Outward Bound programs are regularly reviewed and audited by both internal and external teams in order to proactively identify and assess potential hazards as well as areas of commendation. Outward Bound has been a leader in wilderness safety and risk management for over 50 years and is a co-sponsor of the annual Wilderness Risk Management Conference (WRMC). This national conference brings together outdoor industry leaders to learn and collaborate with each other to advance safety and risk management in the outdoor education and wilderness adventure community. Outward Bound instructors are experienced and qualified outdoor professionals committed to their students’ well-being through their values, judgment, words and actions. 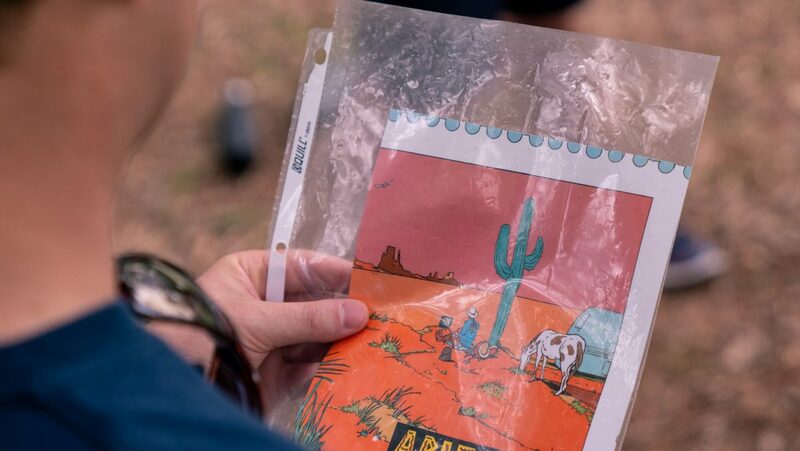 They are certified as Wilderness First Responders or the equivalent and meet all Outward Bound, local, state and federal requirements for their positions. Outward Bound staff are trained to identify, assess and approach risk as a learning tool, to be managed but not eliminated, with the goal of providing Outward Bound students with the opportunity to gain insights and perspectives into their own and their crew’s capabilities that are unavailable anywhere else. Initiatives: Group games and problem solving challenges that foster group interactions and collaborative problem solving. These activities are done standing, sitting, and may involvement movement. Low Elements: Low elements are often used as a progression to the challenge course as they work to build trust, safety, and confidence within the group. To complete low element challenges, participants may be standing on the ground, on low cables, or wooden platforms. There are many ways that participants engage in low element challenges—ranging from group lifting, spotting, balancing, or coaching. Challenge Course: The Challenge Course is often the pinnacle of the group experience. 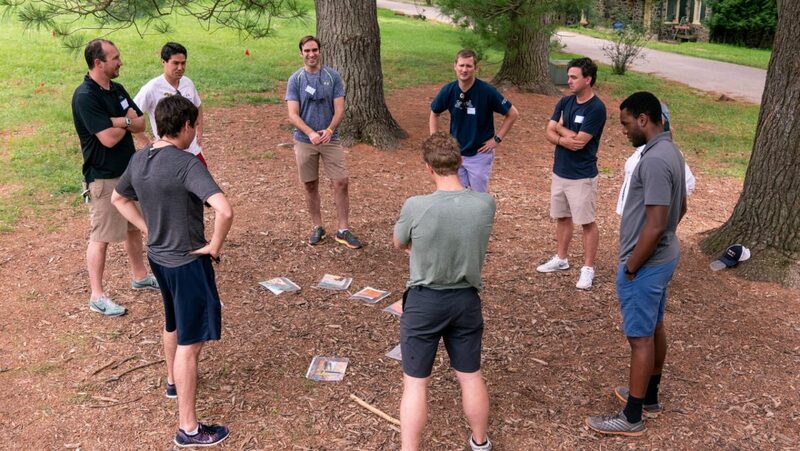 These elements are designed to give both the individual and the group the opportunity to push mental limits and apply group learning from the day. Participants wear a helmet and harness and climb a high element on a belay system. Participants may climb using rock holds, ladders, nets, or ascend poles with metal hand/foot holds. Participants complete the challenges in various ways such as traversing across a cable while holding onto a rope, stepping from platform to platform, or utilizing teammates to cross the challenge on a wooden beam. There are many ways that participants engage in challenge course elements—ranging from climbing to holding the climbers belay rope. Still have questions? Not sure if we're the right fit for your team? Call us and connect with our experts who talk to organizations like yours every day. We've engineered solutions for every industry, and while your challenge is unique to you, we're confident we can solve for it. Contact us and start today.